The experimental chip was designed to operate from as high as 125W to as low as 25W by providing a variety of advanced capabilities to manage power consumption. Power use is largely determined by the cores’ clock speeds and operating voltages. 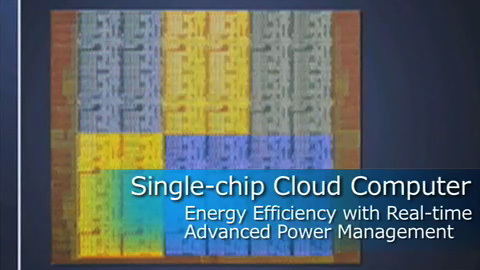 The chip has a unique ability to mix and match voltages and clock speeds for the different cores, or even to turn off entire regions of the chip when not needed. These capabilities can be controlled by software, allowing the application or operating system to intelligently manage power consumption, adapting in real time to use only the energy that is really needed. The demonstration displays how power levels for different sections of the chip change in response to the needs of a series of tasks whose power requirements vary over time. Â The tasks of the application are modeled after parallel computations.